Ummm so why is it every time I promise myself I’ll eat well and ditch the constant cake-eating that something miraculous and tasty comes along to ruin my dreams of a Jennifer Aniston body? While I was trawling the web for some Secret Santa gift inspiration for a coming post, I came across this nifty gifty called Mug Brownies by BakedIn. For everyone who’s ever logged on to Pinterest this is basically where, in under 5 minutes, you make a super delicious brownie in a regular ole cup and you get your dessert fix. The BakedIn version eliminates the need for measuring pesky ingredients, or even thinking about them too much. Its as simple as butter and water. The idea couldn’t be simpler – you get this sweet little giftbox with 4 brownies worth of kit and some instructions. You just need a knob of butter and a splash of water and then you’re away – stir that badboy up, bung him in the microwave and ta-daa! The recipe has no preservatives or artificial flavourings, if that sort of thing bothers you. The ingredients are organic and the packing is 100% recyclable, too, Earth Mama! 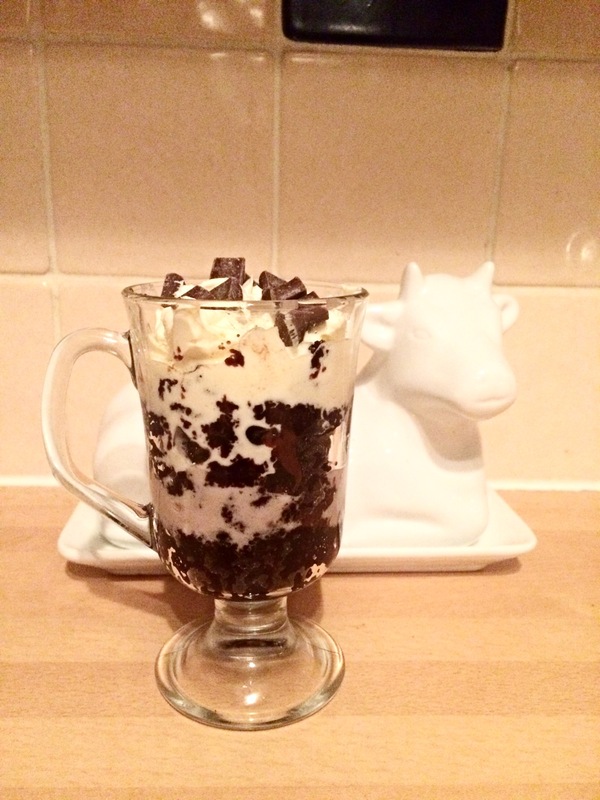 As you can see from the picture I made mine kinda fancy – with a small layer of brownie, a torn up homemade marshmallow (come back soon to see the recipe), another layer of brownie and then some thick whipping cream & chocolate chips. NOM.COM! These are great stocking fillers, great secret santa gifts for the office if you get that sweet tooth colleague who’s always after a sugar fix, great for keeping in the cupboard in case you get a kiddie visitor (you can guarantee a novelty like cake in a cup will go down superbly). These are just great, basically. I got the Chocolate flavour, but you can also get these in Espresso, Choc Orange and Gluten Free. BakedIn also offer a heap of other baking kits and make it super easy to knock up some pretty tasty goodies – check out their Iced Cinnamon Swirl kit (get directly into my belly) – so even the most inexperienced bakers can suddenly find themselves with a delicious cakey dream on their hands.